Can Apple mainstream NFC? Also, PayPal studies the POS and Square gets into politics. Here are some things that caught my eye in the news this week. When will Apple mainstream mobile payments? Now that everyone’s iPhone 4S has a few dings on it and we’ve all grown bored flirting with Siri, our curiosity naturally turns to iPhone 5 and what gifts it will bequeath on mankind. Rumors of NFC (near-field communication, which lets phones pay with wireless technology), are at the forefront again, just as they were before the 4S arrived. As far back as August 2010, when Apple hired NFC expert Benjamin Vigier as its product manager for mobile commerce, expectations have been high that the next iPhone would include wireless payment. That was two versions ago; we must be getting close. Even more so than with previous trends, an enormous captive audience awaits the moment when Apple will introduce it to mobile payments. Scot Wingo notes, in a very good summary of the state of mobile commerce on Seeking Alpha, that Apple has “something like 250 million credit cards on file” in the iTunes store. Although only a fraction of those will buy the iPhone 5 in its first months out, they are sure to be customers who are already comfortable buying things through Apple’s interface. I think the biggest and best surprise will be more than just the date when iPhones ship with NFC, but rather how Apple presents a mobile wallet interface. When you think of how iTunes presented a better way to buy digital music, and when you compare the customer experience in Apple’s retail stores with what you find almost anywhere else, you have to acknowledge Apple’s genius in what we might call the transaction interface. Its programming efforts up front seem as likely to mainstream mobile commerce as any programming that it does behind the scenes to make those transactions occur. 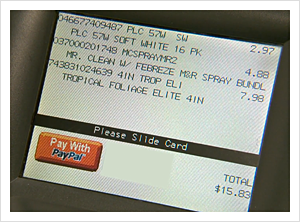 PayPal had those capabilities on display at the National Retail Federation show last month, showing the various ways it is enabling payment at the point of sale. PayPal aspires to go beyond the concept of a mobile wallet in a phone; it wants to offer a “wallet in the cloud” that lets consumers make purchases with just their mobile number and a PIN — no card or phone needed. No doubt, the trials at Home Depot will shed light on just how comfortable consumers are with this idea. So far, Nayar says, it’s too early in the trial to share any of those learnings. In other words, we want convenience, but not at the expense of looking like we’re getting special treatment. No doubt, PayPal will learn more in the coming trials, which are ramping up quickly: The company wants to be at 2,000 points of sale by the end of March. Square picked up a fresh round of publicity this week when word broke that staffers from both the Obama and Romney campaigns were using its plug-in dongle card reader to collect political donations for their candidates. Obama campaign spokesperson Katie Hogan told Nick Bilton of The New York Times that the dongles were being shipped out to campaign workers across the country. The Obama campaign also hopes to create a donation app that works in conjunction with Square dongles so that any supporter can collect contributions with or without the support of the local campaign organization. All donations would obviously go to the campaign — minus the 2.75% transaction fee that Square keeps from every transaction. Although DC is generally slow to embrace new technologies, I have a hunch that tech that makes it easier for candidates to collect money will find a swift and warm welcome. Should Square lose the square?